FNAF Pets addon includes 5 animatronic packs taken from different parts of Five Nights at Freddy's. In aggregate, there are more than 20 animatronics that will inhabit your world. Many of them can become your friends if you tame. For example, Freddy will follow and protect you from enemies and other animatronics. Now all animatronics can be tamed. There is a new boss who is a bit stronger than the ender dragon. Added new blocks and items created based on the game. Addon updated for PE 1.1.1. New armor and spawn eggs. 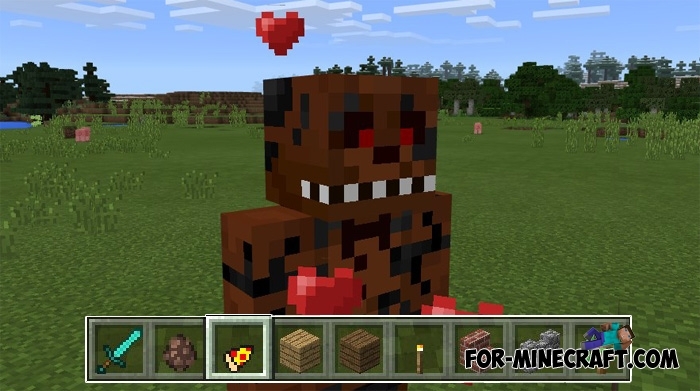 The FNAF Pets replaces some original mobs, mostly villagers. In addition, some robots will receive increased characteristics and assume the role of bosses. If you did not play FNAF, then you are unlikely to like this addon. You can install only one pack of five, but you can switch between them at any time. Some animatronics are repeated, but in each package they have some differences.